RSW- Artwork page, "When Apples Are Ripe"
Fall of 1944 or '45. Mr. Newton purchased two others paintings from RSW. See also the Scrapbook to read about all the Window Pictures. Read more about Woodward's "Apples" in the Scrapbook. "Painted in fall of 1944 or 5. 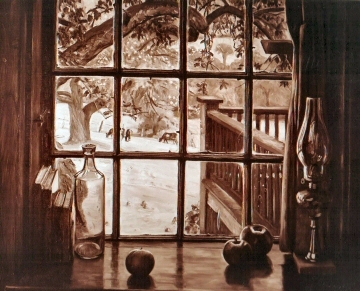 A window picture of the little S.E. window back of my easel. 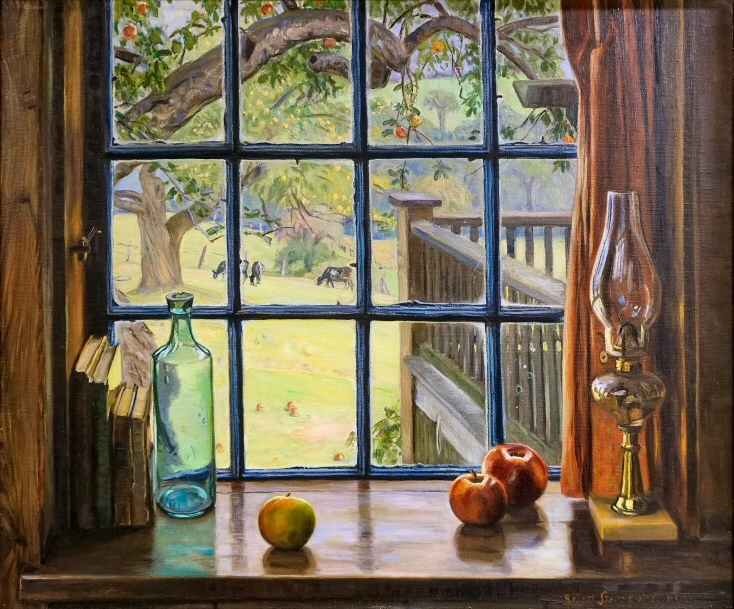 Apple time with apples showing in the orchard outside, apples on the shelf, and the brass and marble lamp against the curtain to the right, the lamp painted in masterly form." "Bought from the studio in the winter of 1947 by Mr. Herbert B. Newton, of 214 Oak Street, Holyoke, Mass.. Mr. Newton also owns From Our Forefathers 27 x 30 and Up In Vermont 36 x 42 which see. Mr. Newton also purchased Up In Vermont (36 x 42) and From Our Forefathers. 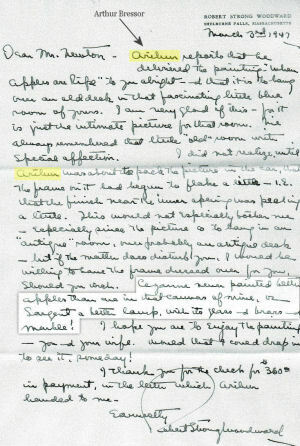 To the right, is an image of a handwritten letter from RSW to buyer Mr. Herbert B. Newton. Highlighted in the letter, RSW comments on his own ability to paint lamps and apples in comparison to two other artist Paul Cézanne and John Singer Sargent. Below, are images of both Cezanne and Sargent's work mentioned in RSW's letter (above). 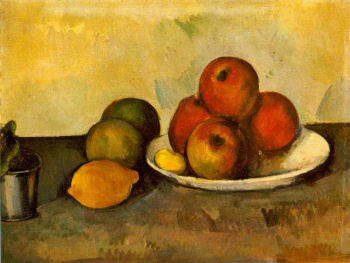 The first are apples painted by Paul Cezanne in Still Life with Apples (1883-1887). 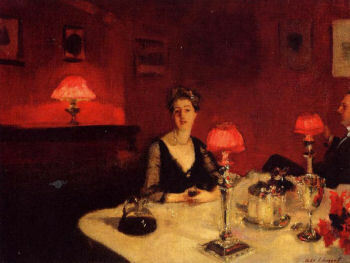 The next is John Singer Sargent's Dinner Table at Night as an example of lamp's painted by the artist.